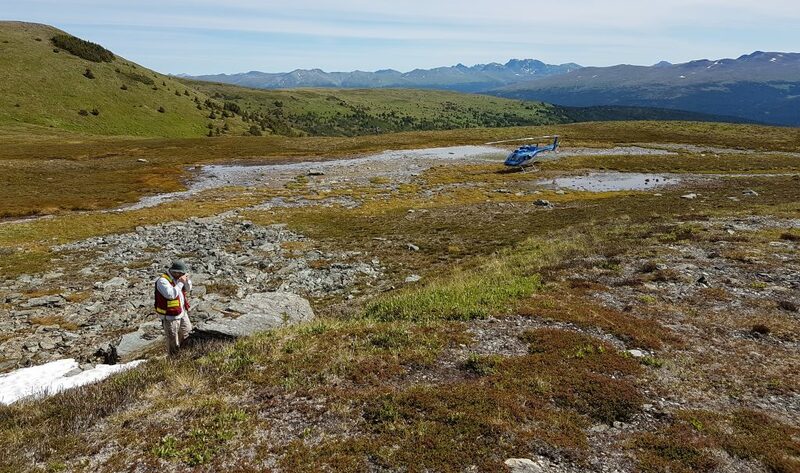 Vancouver-based development company Kutcho Copper Corp. (TSX Venture: KC) is closing out 2017 on a high note and looking ahead to a busy year at its Kutcho high-grade copper-zinc project in northern British Columbia. In mid-December, the company changed its name to Kutcho Copper Corp. from Desert Star Resources Ltd., and its ticker to “KC” from “DSR”. 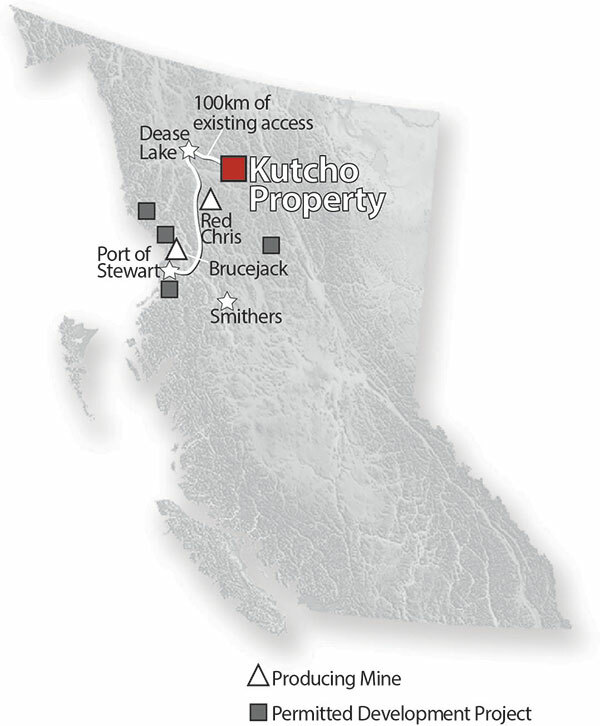 Location map of Kutcho Copper’s Kutcho copper-zinc project in northern British Columbia. Map credit: Kutcho Copper. The rebranding dovetailed with a milestone $117-million financing package and the closing of Kutcho Copper’s acquisition of a 100% interest in its flagship Kutcho copper-zinc-gold-silver property, located 100 km east of Dease Lake, within the territory of the Tahltan and Kaska First Nations. Mineralization was first discovered on the property in 1968, and since then the property has had several owners including Sumitomo, Homestake Mining, Barrick Gold and most recently Capstone Mining. Over the past year Kutcho Copper has moved quickly to build up the company and fast-track development of the property, highlighted by the tabling of a strong prefeasibility study in June. Geologically, the property sits within the King Salmon Allochthon — a narrow belt of Permo-Triassic island-arc volcanic rocks and Jurassic sediments — nestled between two northerly-dipping thrust faults. Some of that work was carried out by Western Keltic Mines, which drilled in 2004-05, before selling the property in 2008 to Capstone, which drilled another 10,000 metres the same year and released a preliminary economic assessment in 2009 and a prefeasibility study in 2011. Kutcho Copper’s revised prefeasibility study of mid-2017 envisions a 2,500 tonne-per-day underground mine producing an average of 33 million lb. copper and 42 million lb. zinc annually over 12 years. The initial capital expenditure is estimated at $221 million, while the after-tax net present value is calculated at $265 million using an 8% discount rate, and the internal rate of return at 27.6%. These project economics were generated using prices of US$2.75 per lb. of copper and US$1.10 per lb. of zinc, which are much lower than current spot prices. Mineralized material in the “probable reserve” category stands at 10.4 million tonnes grading 2.01% copper, 3.19% zinc, 0.37 gram gold per tonne and 34.61 grams silver per tonne (or 2.92% copper equivalent). By dropping the resource cut-off grade to 1% copper from 1.5% copper for all the zones, Kutcho Copper increased the measured and indicated tonnage by 50% to 16.9 million tonnes grading 1.89% copper, 2.87% zinc, 0.36 gram gold per tonne and 32.8 grams silver per tonne. Another 5.8 million tonnes at slightly lower grades lie in the inferred category. The additional tonnage has not yet been considered in the project economics. Examining rocks at Kutcho Copper Corp.’s Kutcho copper property in British Columbia. 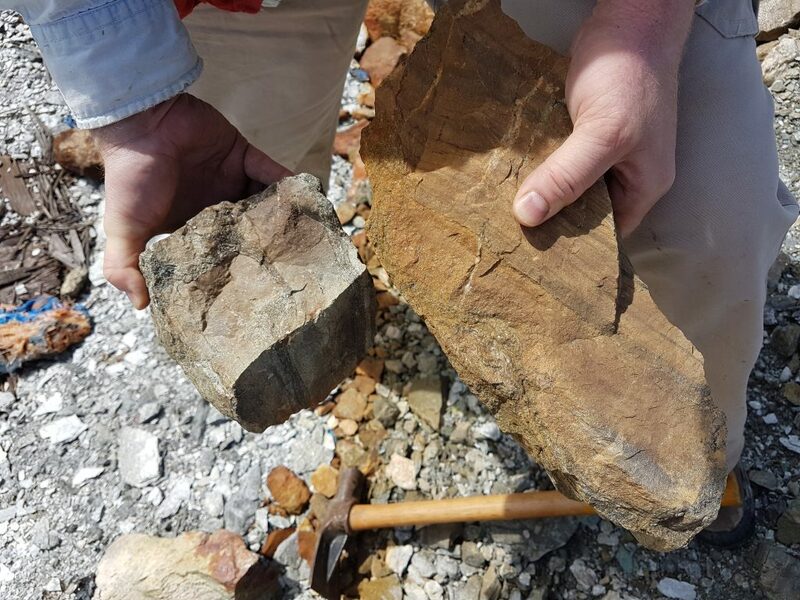 Photo credit: Kutcho Copper Corp.
A closer look at copper-zinc mineralized material at Kutcho Copper Corp.’s Kutcho copper property in British Columbia. Photo credit: Kutcho Copper Corp. The largest portion of the latest financing package is a US$65-million streaming agreement with Wheaton Precious Metals (TSX: WPM; NYSE: WPM), including a US$7 million advance to help Kutcho Copper fund a feasibility study. In exchange, Wheaton will receive up to 100% of the payable gold and silver production from Kutcho which declines to 66.6% once the company has delivered 51,000 ounces of gold and 5.6 million ounces of silver. Wheaton will make ongoing production payments to Kutcho Copper equal to 20% of the applicable spot prices of gold and silver delivered. An additional payment of up to US$20 million will be payable to Kutcho Copper should the mine’s processing capacity increase to 4,500 tonnes per day or more within five years of attaining commercial production.